Network function virtualization market to register a staggering CAGR of 42% over 2018-2024, large scale deployment of NFV technology across IT and telecom sector to drive global industry progression « Global Market Insights, Inc. Bringing about a disruptive change in the way present-day digital networks are being built, operated, and managed, the network function virtualization (NFV) market has established itself as one of the most profitable niche verticals of the sustainable and smart industry. Owing to a substantial increase in the demand for robust data management systems across various business sectors, the deployment rate of NFV technology has witnessed a massive jump over the past few years. Especially, the rising number of collaborations between IT giants and renowned cloud service providers has consequentially boosted the growth prospects of NFV industry. For instance, the recently formed partnership between Indian IT major Tech Mahindra and cloud computing behemoth VMware is a testament to the growing prominence of NFV technology in connecting virtual machines and physical interfaces. Elaborating further, both the firms are likely to integrate VMware’s OpenStack ready NFV platform with digital transformation expertise of Tech Mahindra to assist global communication service providers in accessing new market opportunities, accelerating new service delivery, and enhancing the overall business economics. Moreover, the solutions provided by both the companies would be based on distributed micro data center architecture that will certainly lower the expenses related to network infrastructure. Apparently, the formation of such robust partnerships would optimistically impact the NFV market share in the years ahead. At a time when the global IT and telecommunication sector has been recording unprecedented growth owing to a major shift toward automation, next-generation technology solutions such as NFV have garnered immense significance. With the help of a robust virtualized network architecture in conjunction with NFV technology, the telecommunications companies can now launch new services in a couple of months. Moreover, the deployment of NFV enables telecom network operators to significantly reduce power consumption through consolidating equipment, lower the maturation cycle, improve the flexibility of network service provisioning, and enhance operational efficiency. As a consequence of all these advantages, the IT and telecommunication sector has emerged as the major contributor toward NFV industry share expansion in the recent times. In fact, as per a research report compiled by Global Market Insights, Inc., the IT and telecommunication segment held over 32 percent of the revenue share of the overall NFV market in the year 2017. In this regard, developing economies along the likes of India and China have emerged as the fastest growing terrains for the telecom industry in the last decade. This has, in turn, benefited the NFV market players operating in these nations as the deployment of NFV technology in the telecommunication sector has been on the rise. Testimony to the aforementioned statements is the recently organized SDN & NFV India Congress 2017 which aimed at deliberating on the opportunities and the evolving role of NFV technology on 5G networks in the context of India’s telecom industry. Held for the first time in India, the Congress has been supported by tech giants such as IBM, Juniper Networks, Ericsson, Huawei, UT Starcom, ADVA Optical Networking, and Nokia. Needless to mention, the outcomes of such proactive initiatives would aid the IT and telecom sector to retain the top spot across the application spectrum of NFV industry in the upcoming years. Meanwhile, it would be prudent to mention that the seamless deployment of NFV technology has been facing certain challenges which includes ensuring compatibility with legacy platforms, interoperability, performance trade-off, and simplicity which might prove to be roadblocks in rapid product penetration. However, the applications of NFV technology would undoubtedly drive various business verticals toward the next phase of network evolution and would prepare an ecosystem where the advantages of 5G connectivity would be leveraged in a highly efficient and agile manner. 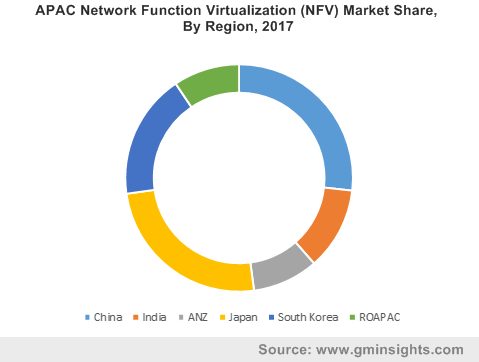 Driven by an escalating demand for server consolidation and data center virtualization, the remuneration portfolio of the global NFV market is projected to surpass USD 70 billion by 2024. This entry was posted in Sustainable & Smart Technologies and tagged Hardware, Integration & Maintenance, Managed Service, Network Function Virtualization Market, Network Function Virtualization Market Growth, Network Function Virtualization Market Size, Network Function Virtualization Market Trends, NFV Management and Orchestration, NFV Market, NFV Market Forecast, NFV Market Report, NFV Market Share, NFV Market Trends, NFV Servers, NFV-MANO, Service, Software, Storage, Switches, Training & Consulting, VNF Software.